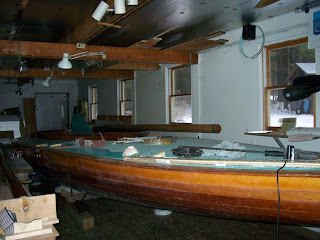 Idem sailboat "Elfemere" in the shop, late 2007. After 111 years, a uniquely Adirondack event; Idem class sailing, remains in the news. A recent article in the New York Times online, "Summer Retreats When Old Money Was New," describes summer life on one of Mother Nature's finest works of art, the 742-acre Upper St. Regis Lake, in the Northern Adirondacks. The article features the Adirondack Great Camp culture and Idem sail boats, favorite topics here on Adirondack Lifestyle. Unique because they are held on only one Adirondack lake, using boats designed specifically for that particular lake, these races have been covered by the NY Times since the early 1900s. Really dedicated readers to this blog may recall a friend and telemark ski mentor, Jim Sausville, has a special connection to Idem sailboats. I consider Jim an artist, but he prefers "fine wood craftsman." Jim is indeed a fine wood craftsman extraordinaire, with a specialty in historic wooden boat restoration. Nearly three years ago in December 2007, I wrote a blog about one of Jim's winter projects, the restoration of one of the original 12 Idem sailboats, the Elfmere. I was lucky enough to receive a tour and description of the painstaking restoration project of this one-of-a-kind beautiful wooden sailboat. It was akin to watching restoration work on a Van Gogh or any other piece of fine art. Jim was working with master builder Jim Cameron, who is also mentioned in the latest NY Times article. I consider Mother Nature the best artist of all, but also appreciate and enjoy humanity's contributions to beauty and art. For a fine example of the artistry possible when man works with Mother Nature, have a look at these stunning photographs of a recent Idem race at Main Line Sportsman. The boats look like they are meant to be there, like the lake and the surrounding mountains. Elfmere photograph courtesy of Joann Sandone Reed.